Our Merry Christmas Soap Six Pack includes six full size bars wrapped in colorful cigar bands and stacked inside a tall Cellophane Bag, including Christmas Tree Forest, Cobbler Spice Cream, Frankincense & Myrrh, Gingerbread Cream, Marzipan, and Candy Cane. A beautiful gift this holiday time of year, with Christmas colors to reflect the season. Other holiday scents may be substituted if necessary. Olive, Coconut, Palm and Castor Oils, Sodium Hydroxide or Lye, Mountain Spring Water and/or Goat Milk, Shea and/or Cocoa Butter, ground botanicals, and scent by Natural Essential Oil or artificial fragrances. 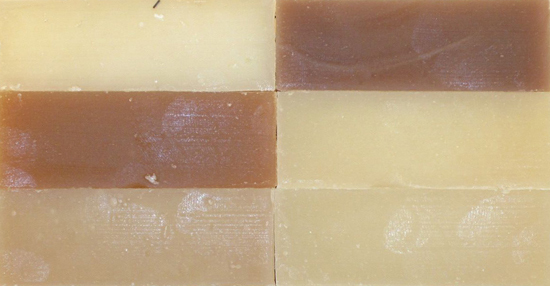 Complete, specific ingredient information for each soap is included on each individual soap's paper cigar band.